While Chrysler offers a great warranty plan to cover powertrain issues in your new vehicle, a Mopar Vehicle Protection plan provides you with even more great benefits. Drivers can use the plan to keep their vehicles looking and performing great for many years to come. One of the biggest benefits of the plan is access to certified technicians. These automotive experts are trained to work with genuine Mopar parts. When an issue in your vehicle arises, you can rest easy knowing that your investment is in good hands. One of the most powerful sedans in North America, the Dodge Charger can be customized with several optional packages. You could request more information from Feeny Chrysler Jeep Dodge about the accessories that are available for this full-size car. The Technology Group adds several accident-avoidance features to the Charger. With some leverage from the Advanced Brake Assist, you might be lucky enough to stop the car just in time to avoid a crash. The Forward Collision Warning comes on before any braking assistance is provided. The Jeep Gladiator was built to shake up the market. As the only open-air pickup truck available, it could be a smart investment if you're someone who has a lot in store for your next vehicle. When people ask us at Feeny Chrysler Jeep Dodge about the Gladiator's capabilities, we point to the fact that it has best-in-class payload and towing. No matter whether you're loading things up in the bed or hauling a trailer, you'll be able to make your way up mountains and through tough terrain. The Jeep Renegade is an SUV that is popular among consumers for many reasons. At Feeny Chrysler Jeep Dodge, we make an effort to keep our consumers informed about the features that come with our models, so keep reading to find out a few of the Renegade's capability features. Two engines are offered with the Renegade. The 2.4L Tigershark MultiAir 2 engine can deliver 180 horsepower. This engine is paired with a nine-speed automatic transmission and can tow up to 2,000 pounds. It is standard with the Limited and Trailhawk. Dodge Journey gives you plenty of reason to like it; the third row seat, a comfortable ride and an affordable price. This popular mid-size SUV also offers great performance features, which is what you want whether you're driving around our town or through the country. Maybe you need to move a sofa for a friend, or you're planning a trip to the lake. No problem. 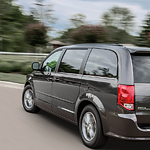 Journey's available 3.6 liter Pentastar V6 engine easily lets you tow furniture, boats and plenty more. Tow up to 2,500 pounds with this powerhouse engine. We here at Feeny Chrysler Jeep Dodge understand the importance of finding the right set of features for your next new car. Do you look for safety features? What about the performance and appearance? We're excited to present this popular full-size luxury sedan. When you drive an SUV, you want the best fuel efficiency possible. The 2018 Dodge Durango is an SUV that is a master of mileage. With this vehicle, you can enjoy more adventures without having to constantly stop to fill up the gas tank. The new Dodge Durango has a 3.6L Pentastar V6 engine that allows you to drive more than 600 miles without stopping to fill up. Aside from this, the 5.7 HEMI V8 engine allows you to drive 500 highway miles on a full tank of gas. The Ram 2500 models continue to outdo themselves year after year, and this most recent option is no exception. While the Ram 2500 has an immense list of great features, one of the characteristics that stands in particular with these latest models would be the awesome powertrain that each 2500 model possesses. Here are some of the options that are sure to get you in the showroom in a hurry! Many drivers feel that the appearance of their car is a reflection of their personalities. The same is true for many of our customers who want a full-size luxury sedan. The Chrysler 300 give you the statement that you need when driving down the road, while also allowing you to incorporate touches that say, "This car is mine!" Wheels are a big part of today's look, and with the Chrysler 300, you have a choice of wheels that measure 17 to 20 inches in nine different designs. Just as important for many drivers is the color.